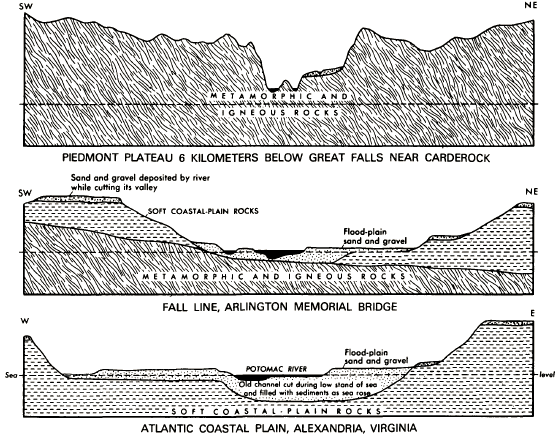 The Fall Line, which has been part of Virginia's landscape since the formation of the Atlantic Ocean, is a geologic feature that has had great impact on the cultural geography of Virginia. That physical pattern of rapids/waterfalls blocked ships from sailing further upstream, limiting water-based transportation of the European colonists. 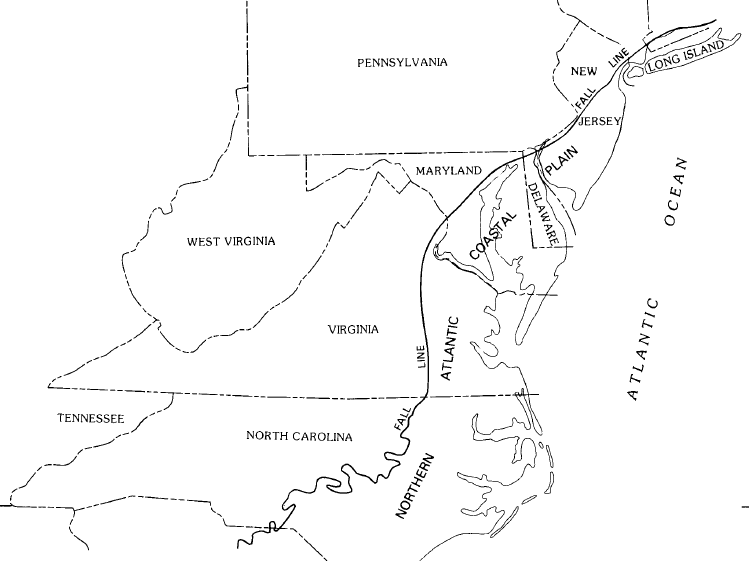 The natural geologic barrier to shipping delayed European settlement of the Piedmont and shaped the location of major Virginia's cities, including Alexandria, Fredericksburg, Richmond, and Petersburg. Today, Interstate 95 is a rough guide to the location of the geologic boundary that separates the soft sediments of the Coastal Plain physiographic province from the hard bedrock of the Piedmont physiographic province. East of Interstate 95, the soil of the Coastal Plain is sandy. Soil is light-colored (sometimes almost yellow or even white). Topography is flat; there are few hills in the Coastal Plain, and some cliffs have been exposed where rivers have scratched out their valleys. The geologic boundary of the Fall Line was created naturally. It reflects the different histories of the Piedmont and Coastal Plain. The bedrock directly to the west of the Fall Line, the Piedmont physiographic province, was created between 250-450 million years ago in the tectonic collisions that formed Pangea. Various volcanoes, crustal fragments, and soft sediments were scrunched up from the ocean bottom and pushed onto the North American continent in a series of mountain-building events known as the Taconic, Neo-Acadian, and Alleghanian orogenies. In those orogenies, chunks of silica-rich crust, plus island arcs similar to Japan or Indonesia, were added to Virginia at its Iapetus Ocean coastline. Virginia got wider, as it accreted new crust. In addition, the mud, sand, and soft sediments on the Iapetus Ocean's Continental Shelf were compressed, metamorphosed, and pushed onto Virginia with each orogeny. 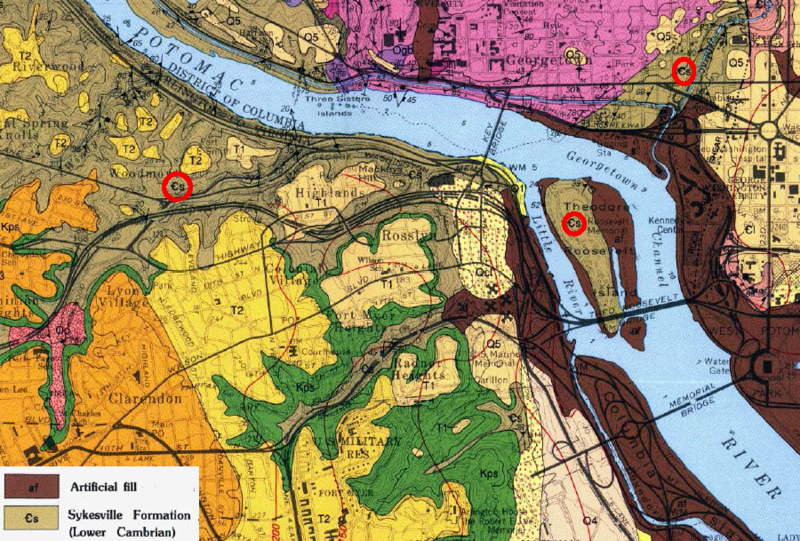 Those sediments, together with terranes of crust and island arcs that were squeezed onto the edge of Virginia when Pangea formed) are now exposed on the surface as the Piedmont physiographic region between the Blue Ridge and I-95/I-85. The final addition occurred about 300 million years ago, when Africa bumped into the North American continent and the Iapetus Ocean was terminated with extreme prejudice. 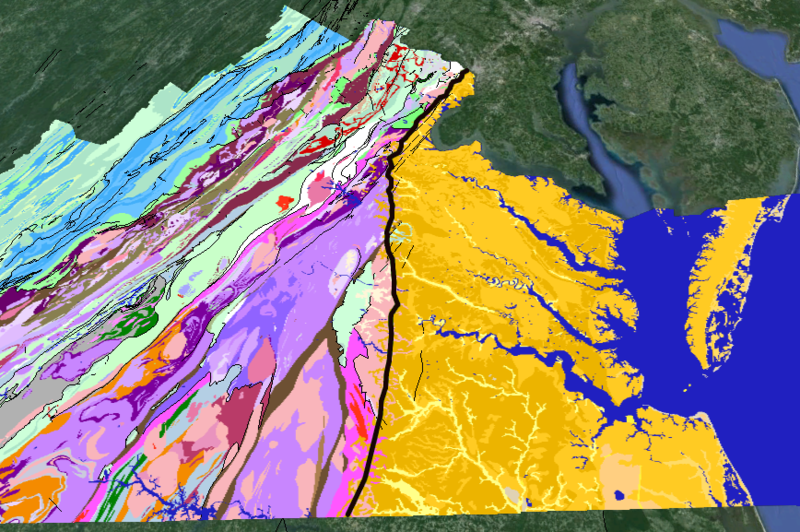 Once again, Continental Shelf sediments were squeezed onto Virginia. As the continental plates pressed together, the soft sands, shales, and muds - equivalent to what is on the bottom of today's Chesapeake Bay and Atlantic Ocean off the coast at Virginia Beach - were buried, baked, and metamorphosed. They became the hard crystalline rock now located between I-95/I-85 and the Blue Ridge. The collision formed the bedrock of today's Piedmont, the largest physiographic province in Virginia today. 250-200 million years ago, as the Iapetus Ocean disappeared and Africa merged with North America, Virginia ended up in the middle of of the supercontinent known as Pangea. A tall mountain range was located where I-95 is today. It had been pushed up by the tectonic plate collisions, just as the Himalaya mountain range has been uplifted over the last 50 million years by the collision of India with Asia. The Fall Line developed much, much later, but its beginning was the formation of the hard Piedmont basement rock and the roots of those ancient mountains. 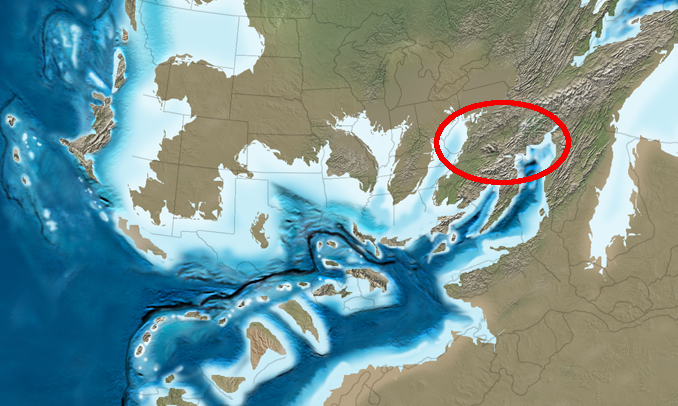 The old continental shelf of the Iapetus Ocean and the terranes accreted onto Virginia during the Taconic and Acadian orogenies were metamorphosed, while the igneous mountain roots cooled to form additional hard bedrock. The basement consists of the rocks formed during the Grenville orogeny one billion years ago, the younger metamorphosed rocks formed during the Taconic, Neo-Acadian, and Alleghanian orogenies, and the igneous chunks remaining from old mountain roots and the terranes that were accreted onto the continent. What goes up must come down. After Pangea split up, 20-25,000 feet of the mountains eroded away over 200 million years to expose the Piedmont's bedrock. The metamorphic and igneous formations of the Piedmont do not stop at modern I-95/I-85. That hard crystalline bedrock is buried below the soft sediments of the Coastal Plain, and the "basement complex" continues all the way from the Blue Ridge to the edge of the Continental Shelf. Wells drilled through the coating of sediments east of the Fall Line encounter the crystalline bedrock at ever-greater depths to the east. Underneath the Eastern Shore, the basement complex is about 10,000' deep. The last eastern exposure on the surface of the Piedmont bedrock is zone of waterfalls and rapids known as the Fall Line. When Gov. Alexander Spotswood led an expedition west across the Piedmont and across the Blue Ridge to the Shenandoah River in 1716, his party discovered that the sandy soils common near Williamsburg were rare west of the Fall Line. 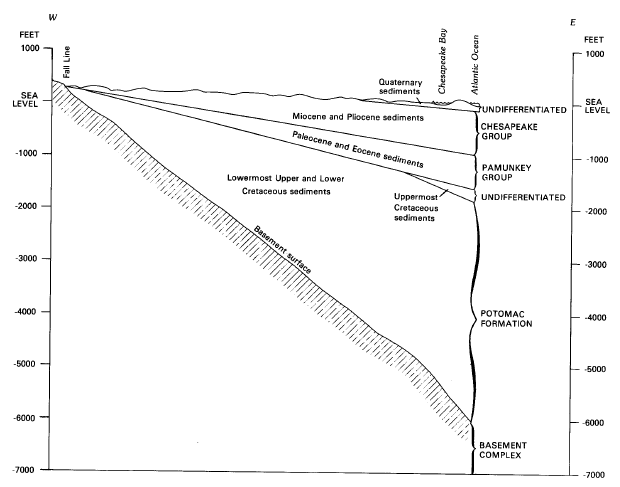 East of the Fall Line, the geology story is simpler. The ground exposed at the surface, the material of concern to farms and builders, consists of sediments that are younger and softer than the Piedmont bedrock. Much of those sediments in the Coastal Plain eroded off of the ancient Appalachian Mountains that were pushed up in the final Alleghanian orogeny. For the last 300 million years, rain and wind has etched away those mountains, carrying sand and mud westwards towards Illinois and eastward towards the Atlantic Ocean. Road cuts through West Virginia expose the layering of the oldest layers of sediments, even some dating back to erosion from the mountains that were lifted up by the Taconic and Acadian orogenies. On the eastern side of the old Appalachians, the oldest sedimentary layers from the Taconic and Acadian orogenies disappeared when Pangea broke up and Africa moved away. The sedimentary layers still present in eastern Virginia have been deposited for the last 150 million years, and document the final stages as the ancient Appalachians once located along I-95 have eroded to a flat plain. 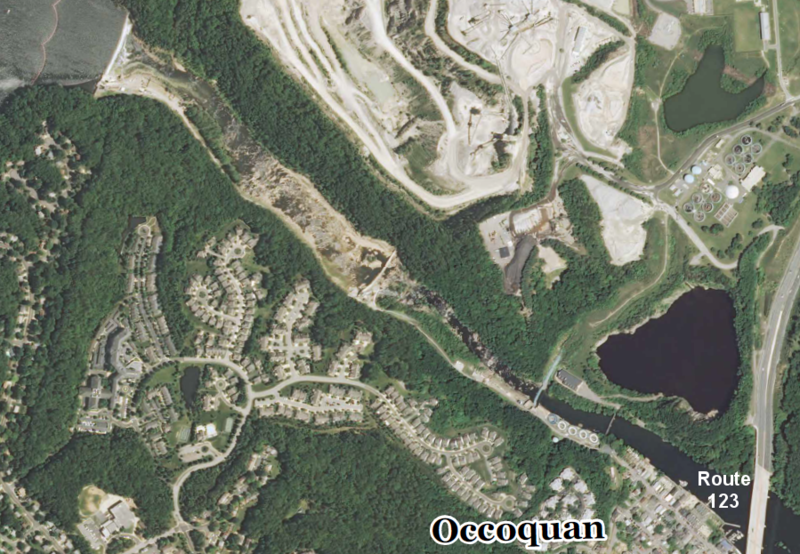 Only their igneous roots remain, exposed in granite quarries and outcrops at Occoquan, Goochland County, Richmond, and Petersburg. 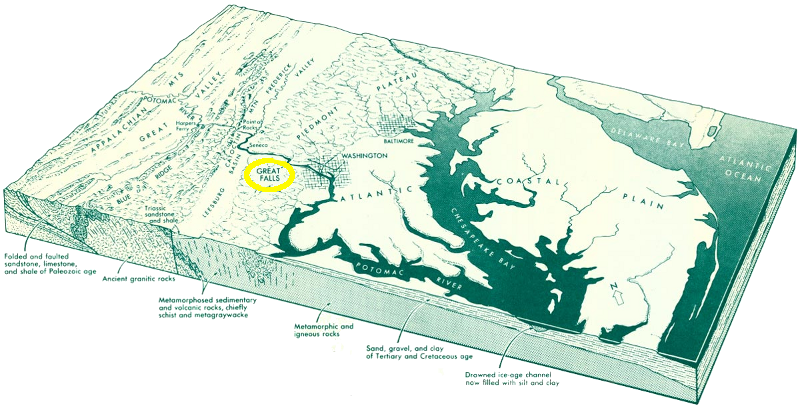 In addition to sediments deposited by mountain erosion, marine sediments were deposited in eastern Virginia when sea level was high enough. 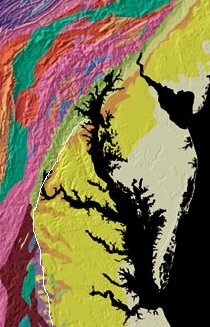 Today's Coastal Plain includes sediments washed off the ancient Appalachians over the last 150 million years, plus deposits from the Atlantic Ocean when it covered the land up to (and occasionally beyond) the current location of I-95/I-85. 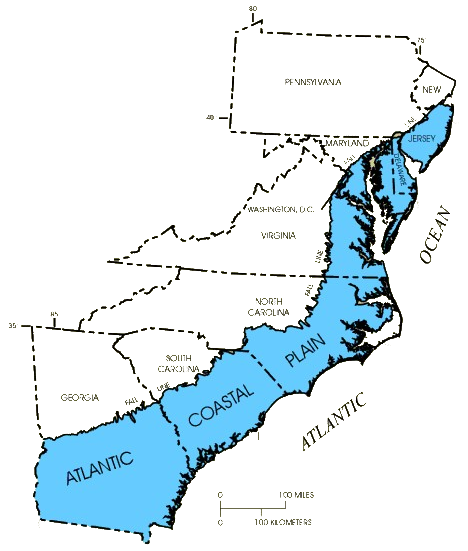 Two processes occurred after the last orogeny in Virginia 300 million years ago to create the Coastal Plain: 1) freshwater rivers eroded the modern Appalachian Mountains and carried debris to the edge of the continent and 2) limestone and other minerals were deposited on top of submerged Virginia land when ocean levels were higher. Neither process altered the sediments to convert them into hard crystalline rock. The sediments on the Coastal Plain have not been baked and squeezed tight; there has been no metamorphism comparable to the older bedrock exposed in the Piedmont now. That physical difference between the hard Piedmont bedrock and the soft Coastal Plain sediments is why there is a Fall Line today. Such fords are very rare east of the Fall Line, except on small streams. East of the Fall Line, the river bottoms are soft Coastal Plain sediments; no underwater bedrock offers a hard bottom for an easy river crossing. In Tidewater, colonists avoided building a road network that crossed rivers. Instead, farmers carried tobacco and other agricultural products to wharves and docks built on the edge of the rivers. Shipping mostly by water minimized the need to get wagons across a river. When necessary, colonists such as George Mason III (father of the man who built Gunston Hall and was principal author of the Virginia Declaration of Rights) created ferry crossings to get across Coastal Plain rivers. East of the Fall Line, the Piedmont bedrock is buried beneath young, unconsolidated sediments that hardly qualify to be labeled "rock." 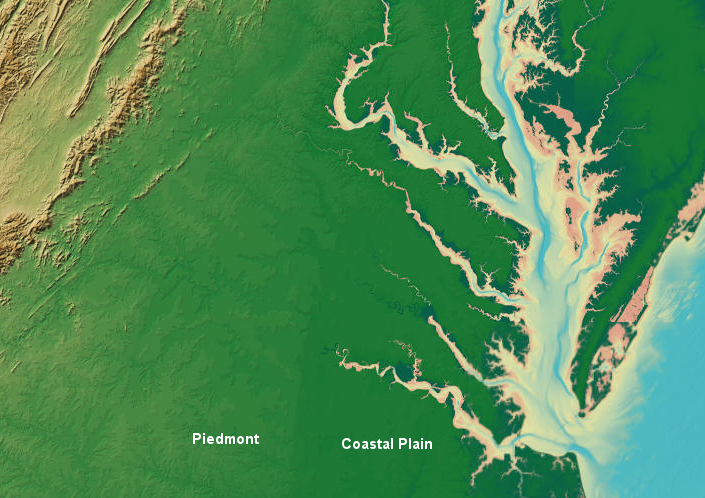 When a river flowing east towards the Chesapeake Bay reaches the eastern edge of the Piedmont and encounters the easier-to-erode sediments on the Coastal Plain, the flowing water washes away those soft sediments. At the Fall Line, the energy of the river carves a deeper channel in the softer Coastal Plain sediments than in the Piedmont bedrock. The difference in the depth of the channel results in rapids and waterfalls; the water flowing off the Piedmont falls to sea level at the Fall Line. 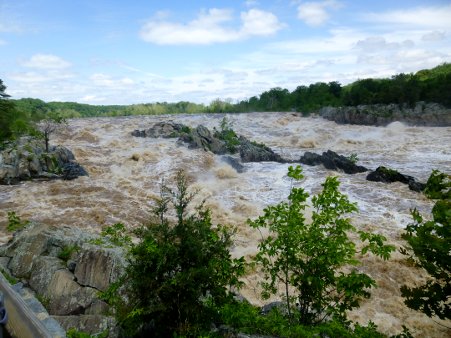 Such rapids and waterfalls are most obvious at Great Falls on the Potomac River, on the Rappahannock River at Fredericksburg (look westward from the I-95 bridge), and on the James River near downtown Richmond (look westward from any bridge between I-95 to the Huguenot Bridge). The Fall Line waterfall on the Occoquan River near Lorton has been "dried out" by the construction of a dam, and only a trickle of water flows over the Occoquan Reservoir dam in the summer months. 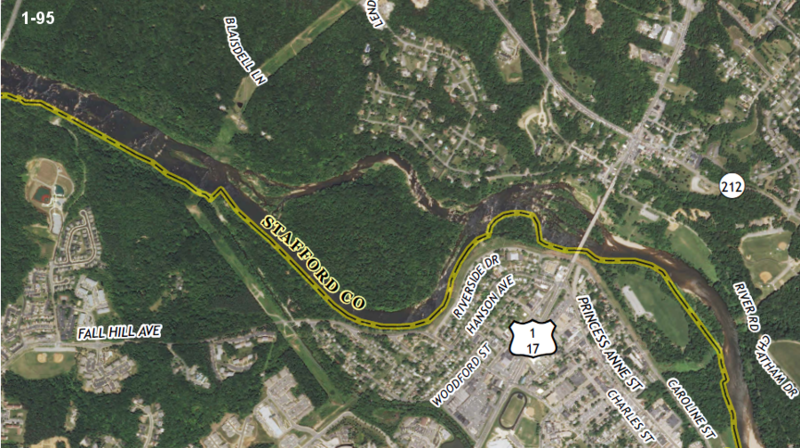 Fairfax Water kept the area closed to public use after acquiring the dam and reservoir complex in the 1960's, but starting in 2015 the utility agreed to open its Fall Line property upstream from the town of Occoquan to public visits. People will no longer need special permission (or have to sneak past the gates...) to see the exposed rocks at the Fall Line. The Fall Line is a zone rather than a narrow line; rapids and waterfalls may extend up to a mile. 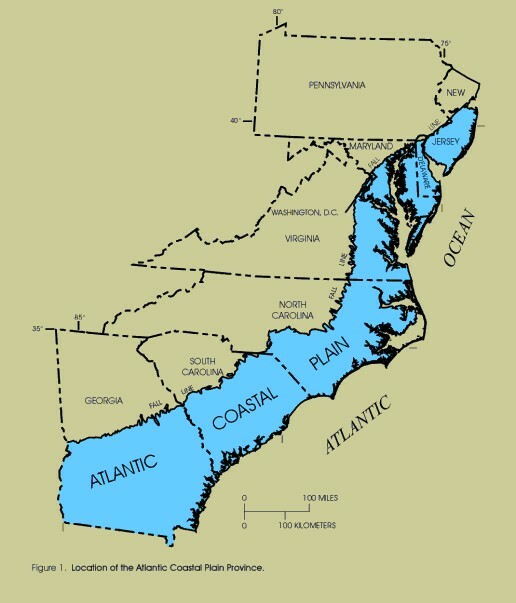 The zone between the Coastal Plain and the Piedmont physiographic provinces may be drawn even wider, because the actual waterfalls may be far upstream from the geologic boundary between the Piedmont and Coastal Plain bedrock. As the rivers etch their way through the bedrock at the contact between Piedmont-Coastal Plain, waterfalls are migrating upstream (towards the west). 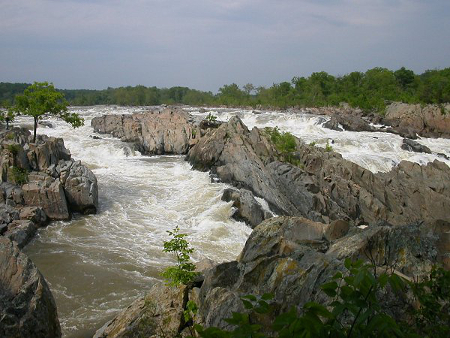 For example, the bedrock in the Piedmont is the hard crystalline rock exposed at Great Falls on the Potomac River. The eastern edge of that hard rock formation is downstream on Teddy Roosevelt Island. 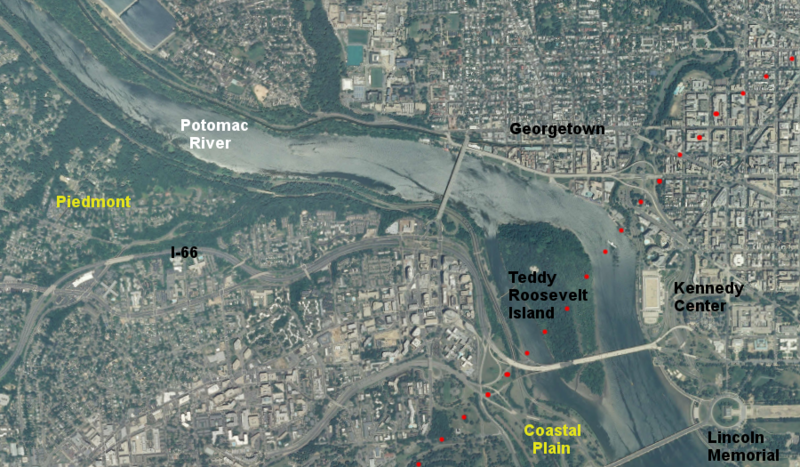 The contact between Coastal Plains sediments and exposed Piedmont is underneath the Teddy Roosevelt Bridge at the eastern end of I-66, where it crosses the Potomac River to connect Rosslyn with the District of Columbia at the Kennedy Center. Over time, the erosive power of the Potomac River will move the waterfall further upstream, past Riverbend Regional Park in Fairfax County. 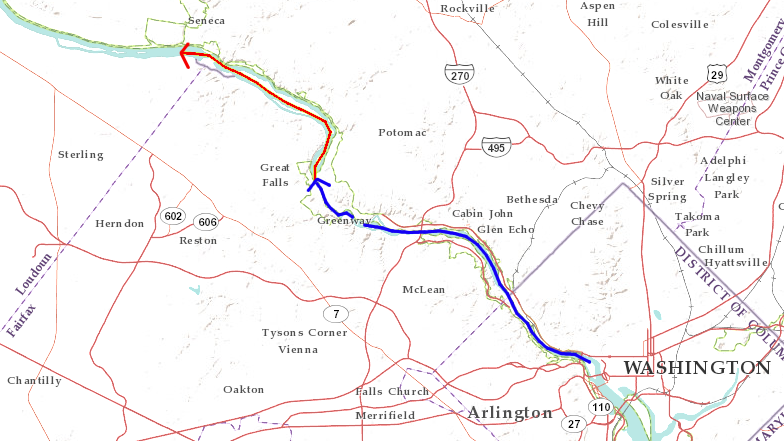 Great Falls will move far enough upstream to get past the Piedmont bedrock, and to etch away at the softer Triassic Basin sediments near Seneca Creek. 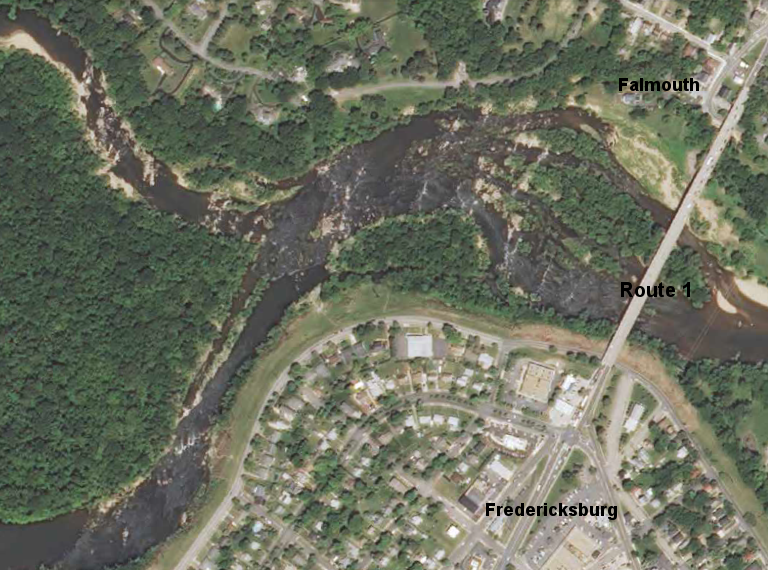 Because the resistance of the bedrock will be less in the Triassic Basin, Great Falls will change into a series of gentler rapids over the sandstone of the Triassic Basin. It took 2 million years to etch a channel 14 miles, an average of one mile each 150,000 years. There are about eight more miles of Piedmont bedrock before reaching the Triassic Basin. Using very simplistic math, the remaining lifespan of Great Falls is about 1-1.5 million years. 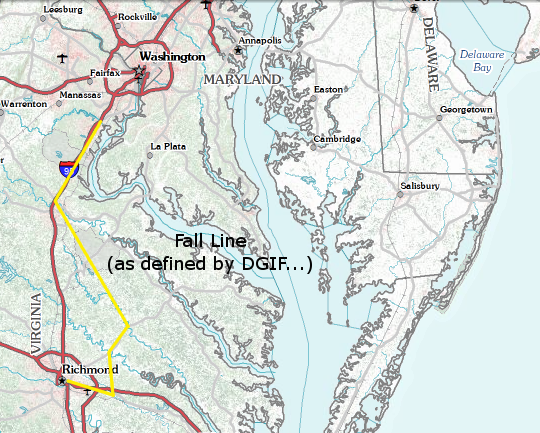 The Fall Line may be interpreted as a 14-mile wide zone on the Potomac River, but the Virginia Department of Game and Inland Fisheries (DGIF) requires a specific location for the Fall Line to facilitate enforcement of different regulations for freshwater vs. anadromous/saltwater fish.